It’s lights, camera, action at our neighboring Peter Skene Ogden Scenic Viewpoint. The backdrop of the 3 Sisters, Mt. Bachelor, and other Cascade Mountains will be sure to make for some excellent cinematography in the new train engine commercial that was shot at Central Oregon’s favorite viewpoint. As stealthy as possible, I attempted my “paparazzi” stance in the big sagebrush, as I snapped a picture of the great filmmaking event! 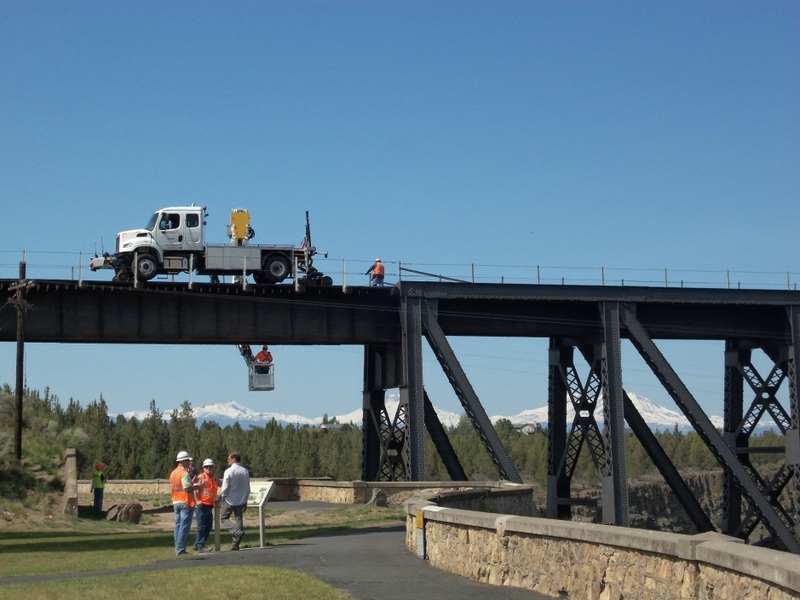 The crew used tractors, cranes, pullies, and lots of expensive looking cameras to get the perfect shot of the railroad bridge over the Crooked River for their television commercial for an unidentified train company! The production company found the landscape picturesque for their railroad shot. Even though I smiled my best smile and attempted to rub off the Power Q perfume I was sporting from the recent toilet clean, the crew resisted temptation to have me be in their commercial. I was certain they might choose me to partake as the distressed damsel in the Old West shootout scene, but I soon found out that their commercial did not include an Old West shootout scene. Too bad. Nonetheless, will be scouting the tube for a glimpse of the commercial with familiar scenery.